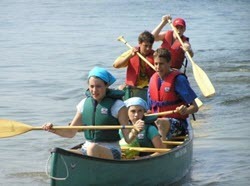 Camp enrollment is the concern of every camp's professional and lay leaders. Because both new camper recruitment and the retention of existing campers impact enrollment, the JCamp 180 team has developed a training program for camp professionals and lay leaders that shares the theory as well as best practices in both recruitment and retention. Camps operating with less than full enrollment know the impact that an additional five, ten, or even more campers would have on programming and finances. Everyone who has participated in a camp fair knows that these 20th century programs provide visibility to the camp but do little in actually bringing in new campers. New techniques are needed for the 21st century – techniques that use 21st century tools and address 21st century expectations. The JCamp 180 enrollment support program is based on a curriculum that has been developed with the help of outside experts, movement leaders, and camp people like you. The program is designed so participants leave with a comprehensive enrollment plan (both recruitment and retention) as well as a list of take-away actions that will enable them to achieve that plan. This enrollment program will provide participants with tips and techniques to achieve your enrollment goals, whether those are for five or fifty additional campers. Although each workshop can stand alone, because sessions build on prior learnings, participants are encouraged to participate in all workshops throughout the year. Designed for mid- and senior-level staff as well as lay leaders, the full impact of this program will come to camps that devote at least one staff person and one lay leader to complete the entire curriculum. By the end of the program, participants will have assembled a workbook that summarizes best practices and recommendations in each of the program focus areas. This workbook includes models and worksheets that each camp will have customized for follow-up actions to pursue the camp's enrollment objectives. You can find recorded webinars and other resources for the 2017/2018 cohort of the JCamp 180 Enrollment Program on our website. Location: Springfield, MA at the Springfield Sheraton Hotel. Specific room TBD. To achieve our goal--increase enrollment!--we need to be fully engaged. Here's what that means. We ask for a primary contact and a secondary contact (one professional and one board member). Primary and secondary contacts will be asked to sign a contract of commitment. At least one representative of each camp should be present at each in-person and virtual session. Primary contacts should get caught up if s/he misses a session. We ask you to keep your other colleagues abreast, and invite them to join our sessions. You will be asked to continue working on exercises and the "mini-plan worksheets" at the end of each chapter between sessions, and to share your work during peer working group sessions and webinars. Peer working group sessions are mandatory. They work really well when everyone is actively engaged--sharing progress and challenges and seeking advice. But also offering your own advice, and sharing your own camp's experience. Everything builds towards the in-person retreat. Everyone comes away from the retreat with a formal, comprehensive, and written enrollment plan. Careful work along the way will make assembling this plan natural and easy--and the results will be very powerful. This program is for camps that want to measurably improve recruitment and retention. The work is sophisticated, ambitious, and even exciting and fun! We will provide the structure, you provide the commitment, and the results will be substantial. Staff and Board members of camps affiliated with JCamp 180 are eligible to take part in any of the sessions throughout the year. These sessions are provided at no cost to participants affiliated with JCamp 180. There are a variety of resources to help with improving enrollment at camp on our knowledge center.